Is your home’s exterior lacking? If the outside of your house needs a facelift, check out these creative and cheap ways to update curb appeal! We often spend lots of time and money making the inside of their homes pretty, but what about the outside? Is your home’s curb appeal lacking? Mine WAS! We were having some roof issues and had to replace it a few weeks ago…so you know the drill. NOW our whole exterior needs a makeover! Let’s be honest, the inside of our home is where we spend most of our time, so it’s only natural to let the curb appeal slide. If the outside of your house is looking dingy and sparse, there are things you can do even if you’ve invested all your time and money into the inside of your home! Let’s look at some creative and cheap ways to update curb appeal. We recently had to power wash our siding because it had turned a green color…yuck! You’d be amazed at what’s hiding under the years of neglect and dirt. Not only are you hiding the beauty of your home’s siding, but you could be damaging it as well. You can rent a power washer and do the work yourself or hire someone to do it for you. If you’ve never used a power washer, it’s best to hire someone as you can damage the siding. Regardless, a good washing of your siding, decks, and walkway can greatly improve your home’s curb appeal. If you have no interest in being a gardener, invest in some evergreens. Evergreens are easy to take care of and will keep your home looking beautiful all year round. Speak to someone in the gardening department of your favorite home improvement store about which plants are best for your yard. Evergreens can be expensive if you purchase mature plants. Instead, look for small plants. Just keep in mind how large they’re going to grow so that you can plant them in the appropriate location. HOLY COW, this can make a huge difference. 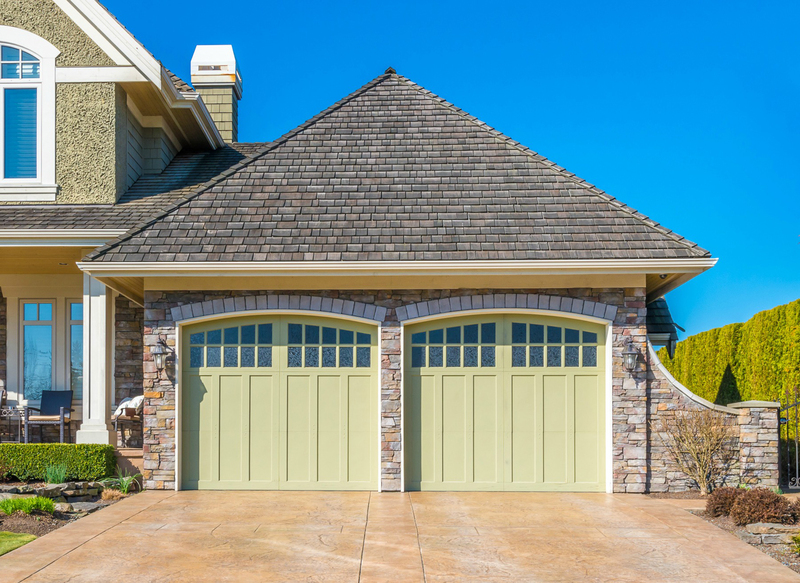 Want to update the look of your boring steel garage door? For less than $30, you can install magnetic carriage hinges to your garage door to give it a brand new look. There’s no drilling involved. These strong magnetic carriage hinges are all-season and made to last. I got mine at my local hardware store, but you can find them online HERE. Want an instant change that costs very little money? Try some front porch curb appeal and paint your front door. If your door has always been boring or is showing it’s age, paint it. Don’t be afraid to be bold either. This can be a great way to make your home standout from all the others. Best of all, you’ll need very little paint for this project. Check out these 4 INEXPENSIVE FRONT DOOR UPDATES for more suggestions! There are so many ways you can improve the look of your mailbox. You can paint it, purchase a new one, or even build a flower box around the base of your mailbox to add a pop of color. If your mailbox has seen better days, take the time to give it some love. And, if it’s about to fall over, take the time to pour new concrete and reset it. 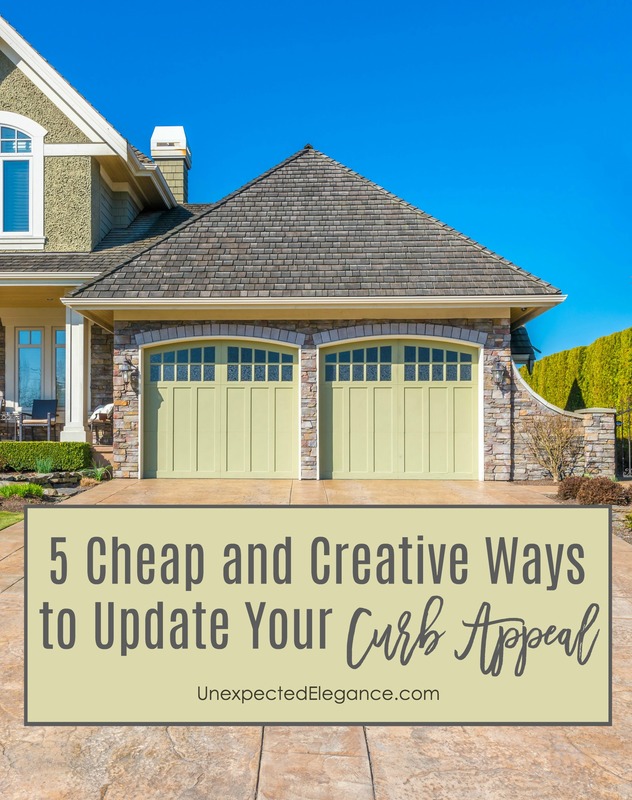 You don’t have to spend a lot of money to update your home’s curb appeal. There are so many inexpensive projects you can tackle that will make a world of difference.